You can find many different races (called Kindreds in T & T) on Trollworld. Here are three of the less common: Minotaur, Youwarkee, and Hunding. Fantasy art calendars are commonplace today and have been for decades, but, I believe that Tunnels and Trolls was the first role-playing game to produce a fantasy calendar. Flying Buffalo did one in black and white way back in 1978. At least I think it was 1978. I don’t have that calendar any more, but it featured art by Liz Danforth, Rob Carver, and a few others whose names I have forgotten. Well, everything old is new again. In December I upgraded my personal computer to a Macintosh. The Mac comes with all sorts of nifty software bundled with it. One of the programs, Iphoto, includes the option of making your own calendar. Back in January this began to look like a really good idea to me, so I did it. With the help of my artistic friends, I have created a brand new fantasy art calendar with a Tunnels and Trolls theme. For example, it includes Trollish holidays like Longest Night (Dec. 21) and Trollgod’s Birthday (Apr. 28) and Sky Dragon eats Khazan (the moon) (June 4). The new calendar runs from March 2012 through March 2013. The idea is to update it with fresh art every 3 months, and to sell the dates to help finance it and pay the artists. You can buy one day on the calendar for $8, two days for $15, and three days for $20. After that the pricing starts over. Want your birthday on a beautiful fantasy calendar? This is your chance. Dates are sold on a first-come basis, so if you want June 5, and somebody already has that date, too bad. Interested, leave a comment and I will contact you. Some very strange beings can be found in this calendar. 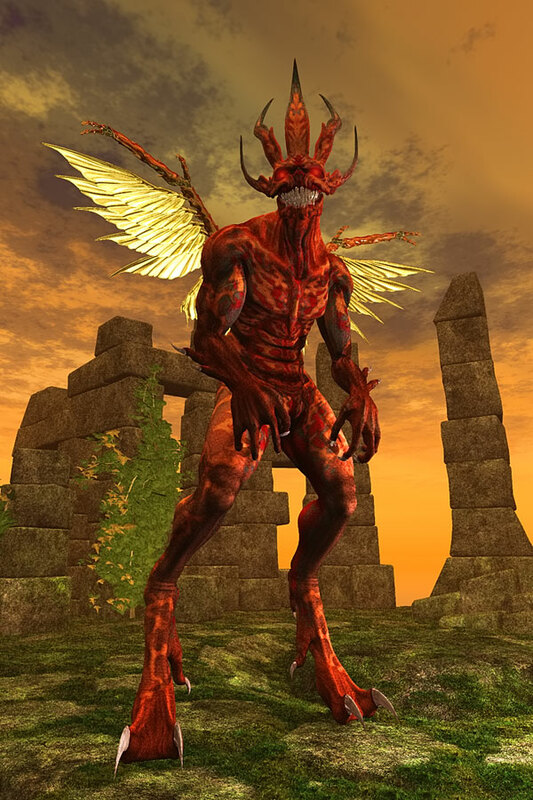 This is the demon Bel-Zaratak as imagined by Ken St. Andre and rendered by Christa St. Jean. If you’ve ever done art for a calendar, created your own calendar, or wanted to be on a calendar, go ahead and leave a comment below.